The Mandala (Sanskrit-‘circle’) is an ancient spiritual and ritual symbol in Hinduism and Buddhism, representing the Universe. In various spiritual traditions, mandalas may have been used for focusing attention of practitioners, as a spiritual guidance tool, for establishing a sacred space, or as an aid to meditation and trance induction. No matter your beliefs, in crafting this ancient circle we can use any medium so that the mandala really becomes personal and a thing of beauty. 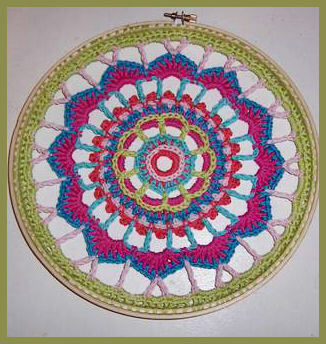 First technique we will explore, crochet of a mandala around an embroidery hoop, by alwaysinmyroom. 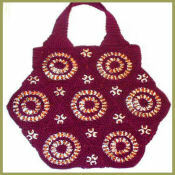 The next exploration in mandalas also uses an embroidery hoop for the design. This one is actual embroidery around the hoop, by dingo66jolene. Though this was her first attempt at embroidery around a hoop, I would say she was very successful. The mandala or dreamcatcher as she calls it, is subtle in color and has a nice detail around the edges. Mandalas do not have to be made of thread. They can also be made on paper with ink or even paint. 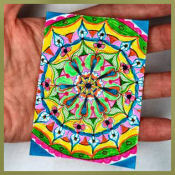 This ATC mandala by Victoria Kamalova, is detailed, compact, dazzeling and very mod looking. Now for something really different. 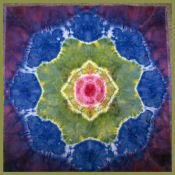 A tie dyed mandala on fabric, by HippieKinder. She did a great job on the dying, and giving the center a real focal point with the choice of colors. 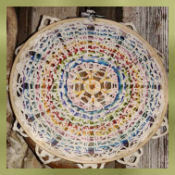 Mandalas can also be made from seed beads, and hung on the wall. These are made by askaboutrpickles and have a wide variety of colors used. 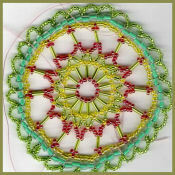 This last one will show that mandalas can be used to create a much larger project. How about a pop tab purse with mandalas? Yes! And alexandraf was kind enough to give us a tutorial how to make our very own. She rocks! The circle form of the mandala offers many options to creating, and give you something beautiful for yourself or to share with a friend. I plan on adding to my wall of mandalas with other hoops art.